SparkFun IT had our first intern in the summer of '12. A fresh high school grad and college dorm bound @JoshAshby. During his summer internship he started a subtle blowgun style Nerf-dart war (and a few other key officemates, I am sure). Start a war for his last day. And then end it with some style. Nerf Darts are astonishingly cheap on Amazon if you know where to look. I bought 400. 1/4" PVC pipe in ~15cm and ~5cm lengths -- Be careful here, some of the 1/4" stock I found at the big box home improvement store was just a hair too small for a dart. 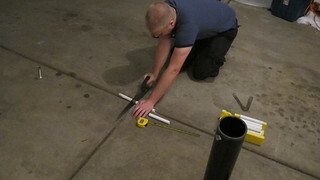 The staff was giving me the eye when I pulled out a dart and shot it out of a 10' length of pipe. Nerf Darts -- Of course. 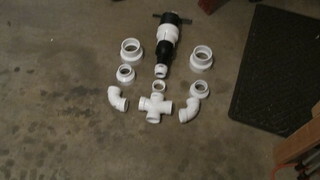 PVC Piping -- for the Air Cannon. 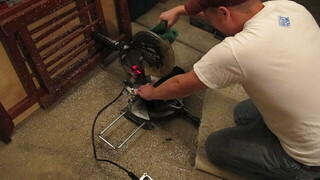 Friends -- Because nobody wants to cut all that pipe by yourself. Something like a RAM Launcher kept coming to mind. If you're anything like me, you start with a vague concept of what you want and figure it out as you go. Caveat: the guy from the plumbing department has "no idea" how to build an air cannon, let alone what a "nerf dart" is, so stop asking. On this project my best source of inspiration were the friends that tagged along. It was @Scottie's idea to stuff a bunch of 1/4" barrels into one big 4" barrel, and I'm pretty sure he also thought it'd be neat to make the business end in the shape of a trident. Initially I had imagined building a grid with the ability to fire 100 darts individually or simultaneously. Something like a Rolling Airframe Missile Launcher kept coming to mind. What proved to be too much work for the allotted time was sorting out control and power mechanisms for 100 darts worth of launch capability (power as in air, not electrons). Simple is better though, so we went with the barrels-in-barrel design. One valve, no control software, 51 darts all at once. Draw it out. Cut the pipes. Simple as that. I did some of the cutting work too, I promise. Knowing that I wanted the assult to be as potent as possible, I elected for the option to fire three barrels at once. However, having no idea what sort of success I would get with that much exhaust area, I needed a fallback. Making the barrel removable was just the compromise I was looking for, allowing testing of triple and single barrel arrangements beforehand, and an easy conversion process between them. Detachable barrels also proved to be a big perk when I went to load it into my car. Plus I'm about 2 pieces of pipe away from a compressed air tshirt cannon. Because I can see myself building one of those in the near future. Some internet critique over at Hackaday brought up the issue of using PVC pipe as a pressure vessel. First, thanks Hackaday for the link. Second, I want to give a little more detail about my research in this area, the pressures concerned with this project, and why I decided to use household plumbing parts for the project. I've included the diagram on the right citing burst and safe operating pressures for PVC. A few of the fittings I used are actually ABS, which has a much much lower pressure failure rating. Both ABS and PVC have operating pressure ratings above 100psi. By some quick research, 2psi is enough to launch at least 2 darts with respectable velocity, so 51 darts should only need < 30psi. When estimating things of this sort, I have what I call a standard doubling rule. Since I estimated needing 30psi, I figure I'll probably want 60psi. Standard doubling rule again, for safety factor this time, and we've only barely exceeded the standard operating pressure for ABS -- critical failure point well within a reasonable safety factor. There is also some talk of Liquid pressures vs Gas pressures. The ABS spec sheet cites Water Pressure ratings at 23 deg C for Schedule 40 as being somewhere between 100 and 200 psi, depending on the type of ABS. I'll yield to someone with more engineering experience than me on this one — I realize there is a difference, but I don't yet know what the difference is. Long story short, PVC and ABS pipe aren't great pressure vessels, and they'll fail catastrophically. It'll throw shards of shrapnel all over the place when it breaks and stab you in the eye (or worse). The takeaway is this: do research, and know your personal comfort with the edge of safety. Lay it all out, glue it piece by piece. Lay it out, glue it piece by piece. Work outside or you're going to lose your vision or something from all those fumes. No, really. I highly recommend using a primer before the glue. Additionally, because my plastic was both ABS and PVC, I needed a special multi-plastic set of chemicals. 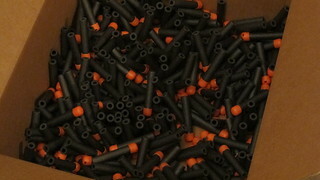 As for setting the 1/4" barrel arrays in the larger 4" holders, expandofoam is a great filler. For this purpose, it doesn't need to be air tight, but air-resistive. My Nerf War / Pnuematic Nerf Shotgun flickr set. You should probably not build this. Its dangerous. If you do, shoot me an email though.